Plate Carrier Individual Trauma Kit » Protective Solutions, Inc. Packed in an 8"x11" waterproof Aloksak container, the Plate Carrier Individual Trauma Kit is designed to fit inside a plate carrier behind the SAPI plate. 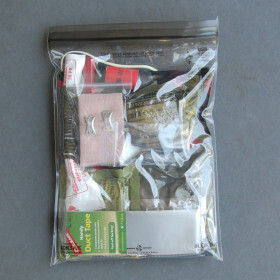 With this placement, the trauma kit is protected and accessible by you or by someone else administering aid. Image shows kit and some of the items included.